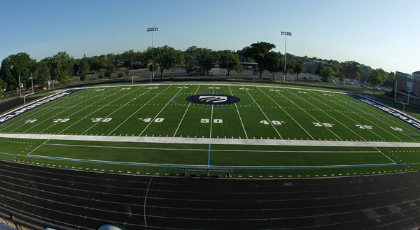 Elmhurst College's Langhorst Field is ready for the start of the 2011 fall sports season after a summer of renovations that included the installation of permanent lights and a new playing surface. The playing surface is used by the College's football and men's and women's soccer teams. With men's and women's lacrosse teams debuting in 2013 and 2014, respectively, five Bluejays teams will be utilizing Langhorst Field for game competition and practices. "The installation of a new playing surface and lights to Langhorst Field is a great asset to the College's athletic teams," said Elmhurst Athletic Director Paul Krohn. "Putting in a new surface and installing permanent lights have provided us with more opportunities t	accommodate our current sports while also preparing for the start of lacrosse." The former artificial playing surface, originally installed prior to the 2002 season, has been replaced with new state-of-the-art FieldTurf. FieldTurf surfaces are currently used by 21 NFL team for either game play or practices. The new FieldTurf surface has an anticipated life span of 10 to 12 years. The new permanent lighting system replaces the temporary lights that have been used at the field for the past several years. Elmhurst teams are already planning on taking advantage of the new permanent lights at Langhorst Field.